What are the clicking sounds you get with an osteopathic adjustment? How do I know if you are properly qualified? I’m pregnant - Can I still have osteopathic treatment? What should I wear when I see an osteopath? We are all considered to be ‘musculo-skeletal experts’ and so there are many similarities between us, however all practitioners do develop their own styles and techniques so treatments even amongst the same profession can differ. In general though most chiropractors tend to treat the spine only, using HVLA techniques. They also routinely use x-rays for diagnostic purposes. Typically patients may require a long course of regular treatment. Physio's on the other hand tend to prescribe rehabilitative exercises routinely. Most NHS physios do very little 'hands on' techniques, however, some private physios will do more 'hands on' work. There may also be a long wait for physio on the NHS by which time acute conditions may have become chronic. Osteopaths treat the whole person and take other areas of the body into consideration rather than just the area in pain. We look for the underlying cause of the problem rather than just applying a 'band aid'. We diagnose with our case history notes, clinical examination and palpation. We treat with 'hands on' techniques, exercise prescription and postural rehabilitation. An "adjustment" is a procedure employed by osteopaths to restore proper movement patterns to a joint and reduce any irritation of the nerve structures around the joint. These techniques are called high velocity low amplitude thrusts (HVLATs) and often cause a cracking noise to be heard in the joints. This noise is a release of gas into the synovial fluid inside the joint. As the joint is gapped by the osteopath, the pressure decreases inside the joint and the dissolved gas is released. This technique frees off the joints very quickly as muscles holding the joint restriction in place let go. Although it is a painless procedure, it is common to experience some muscle soreness for 24-48 hours after an adjustment. Side effects are generally rare, however some techniques may cause some discomfort during treatment and you may experience some tiredness and soreness for a few days afterwards. This is a normal and healthy response to the treatment and is often due to the fact your muscles may have been tense for a while and the treatment which stretches and rekaxes them causes a little soreness and stiffness. Most patients report feeling looser and more comfortable directly after treatment, however it is a good idea to take it easy after treatment to allow the body to readjust. 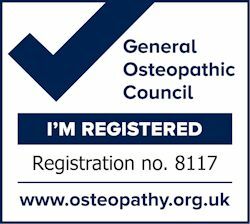 All osteopaths in the UK are required by law (The Osteopaths Act, 1993) to be registered with the General Osteopathic Council and it is an offence for anyone to call themselves an osteopath if they are not registered. They are our governing body and are there to uphold the standards of the profession and ensure the levels of excellence in our training and post-graduate education. It takes 4 to 5 years study at university to obtain the necessary qualifications to become a registered osteopath. The degree course content is similar to a medical degree and focuses on anatomy, physiology, musculoskeletal medicine and practical clinic skills. To qualify students must undergo more than 1,000 hours in the university clinics transferring the written knowledge into practical skills. Paolo Iorio osteopath is registered both at the General Osteopathic Council and at the British Osteopathic Association. It is absolutely fine to have osteopathic treatment when you are pregnant. During pregnancy your body has to cope with a large amount of anatomical and physiological changes and these can place great physical strain on the organs, tissues, joints and ligaments. when your ligaments soften to help accommodate the baby. The pregnant body has to adapt to all these changes and find new ways to walk, sit and sleep and this can result in new aches and pains arising, additionally lots of women find that old injuries start to niggle again. Osteopathic treatment when pregnant can ease some of the symptoms typically associated with pregnancy, such as back, neck and shoulder pain, muscular tension, nausea and vomiting, heartburn and sciatica. In addition Osteopaths can provide advice on breathing techniques and exercises which will help you maintain your wellbeing throughout your pregnancy and can help prepare the way for a more trouble free childbirth by improving flexibility in the pelvis and abdomen. Osteopaths usually require patients to undress to their underwear so that the patient’s whole body can be examined to enable the most accurate diagnosis and permit the most effective treatment. Many patients find it more comfortable to wear shorts and a vest or similar which allows for good treatment and retains patient modesty.